By all accounts, Bobbijo Zoerhof is a good teacher, but she admits to being stymied when it came to helping her students program a robot for their FIRST Robotics team. That’s when a new community partnership between the Grand Rapids Public Schools and the likes of Steelcase Inc., Consumers Energy and GE Avionics came in handy. Enter Joshua Hoekstra, a project manager at Steelcase, who showed up with another award-winning FIRST Robotics team to help program a robot built by one of Zoerhof’s two teams she coaches at C.A. Frost Environmental Science Academy. 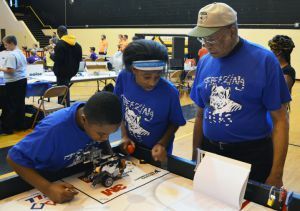 James Peacock, a community school coordinator at Martin Luther King Leadership Academy, had a similar experience when engineers from GE Aviation showed up to guide his team of sixth through eighth-graders. You basically can’t buy the kind of experience provided by GE engineers, Peacock said. “When you have programs like this it takes kids outside of their four-block comfort radius and helps them experience their world in a different way,” Peacock said. “These kids never thought about engineering until they met engineers who looked like them. District spokesman John Helmholdt credits the new partnership with expanding the district’s robotics teams from two to 11 this school year. The district is hopeful this newest momentum shift will help attract enough volunteers to provide robotics programs in virtually every school that wants one in the coming years. After some 20 years of cuts driven by reduced student enrollment that have seen extracurricular and after school programs like debate – valuable to students later in life – dropped, this new partnership is helping them make a comeback, Helmholdt said. For the first time in more than 20 years the district this school year posted a loss of fewer than 100 students compared to the 400 projected. “This partnership is further evidence of the energy and momentum building around Grand Rapids Public Schools,” Helmholdt said. “For the past two decades, the district has been in a state of churn, where we have seen so many of these programs that many years ago used to be prominent in many schools around the district go by the wayside amidst all the cuts, closures and consolidation. The growth in the robotics program is really symbolic of the reinvestment we’re seeing due to the alignment of our community partners. A handful of schools have already expressed interest in forming teams next school year. 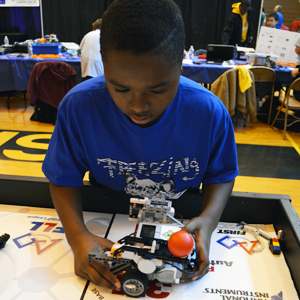 Dec. 6 saw the first ever GRPS-sponsored robotics tournament at Innovation Central High School, and that same day Zoerhof’s FIRST Lego League team of sixth-graders traveled to Monroe Michigan for the state tournament, a mere year after it formed. Zoerhof said aside from gaining hands-on experience with science and technology, the robotics program offers students insight into well-paying career opportunities. She added the partnerships alone set a positive example about the value of working together. She noted one parent volunteered to help even though he didn’t have a student in her class or on one of her two teams.